Breeding Season: Nests are made in loose colonies on open ground, Falklands population nests in huge colonies. Breed at around 6 - 10 years old. Eggs aer laid in October to November and the chicks fledge towards the end of March. Feeding & diet: Largely scavengers on seal and penguin carcasses, carrion, squid, krill, crustaceans and refuse from ships where available, often found following fishing boats. Conservation status: Least concern. Suffers similar fatalities to albatrosses when following longline fisheries or trawlers. 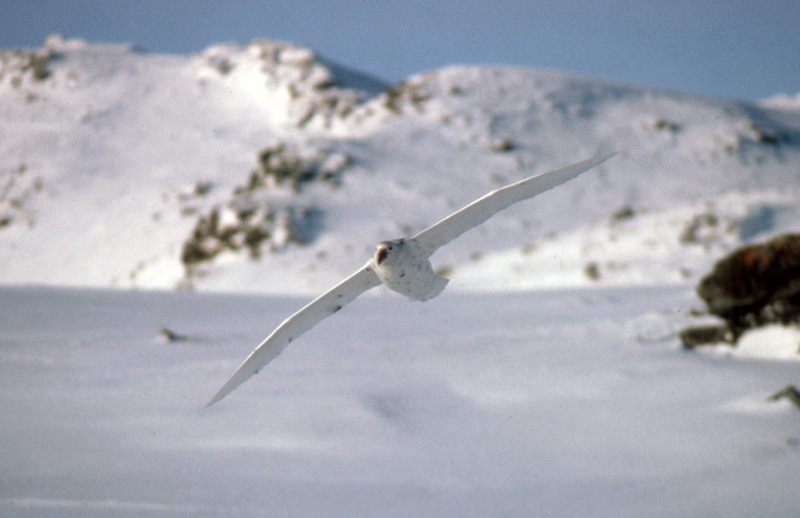 Distribution: Circumpolar, usually found beyond the pack ice in more open water, a few locations on the Antarctic continent, more commonly on Antarctic and sub-Antarctic islands, a substantial breeding population on the Falkland islands. What are Giant Petrels like? Giant Petrels, commonly known as a Geep, GP or to the old sealers as Stinkers. The latter name came from their habit, quite common amongst sea-birds, of vomiting on any one or thing that approached them and seemed to impose a threat. They build the traditional Antarctic nest of small stones, but always seem to manage quite an impressive pile of them in comparison to penguins for example. They can be quite nervous during the breeding season apt to abandon the nest if significantly disturbed. They have left previous nesting areas near to Antarctic bases for instance where in the same circumstances, penguins and other nesting birds have continued to use the area. They spend much of their time scavenging and are always to be found where there is a dead seal or whale carcass. Sometimes eating so much that after a couple of aborted attempts at taking off due to excessive baggage, the only remaining option is to be sick in order to lighten the load. 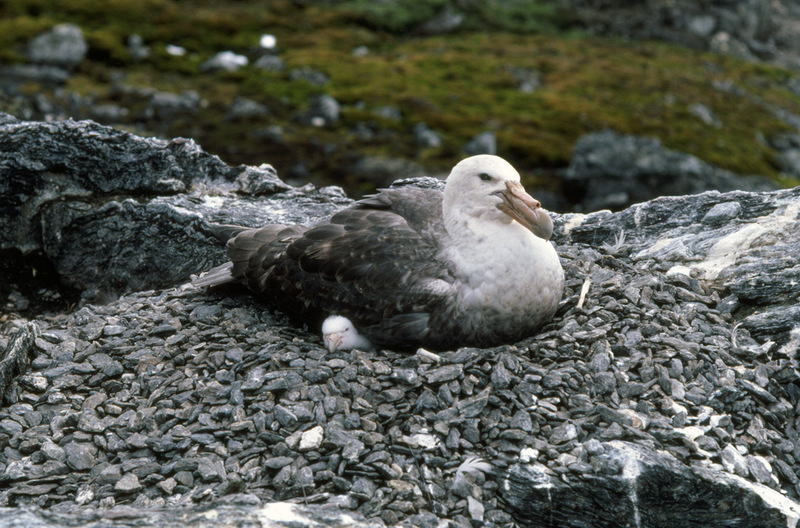 There are two forms of giant petrels, a more common darker grey brown form with a head and neck that becomes paler with age, and a rarer much lighter form, mainly white and flecked with black. They have a large and strong bill capable of ripping open carcasses to feed. Superficially they look like a stockier small albatross. 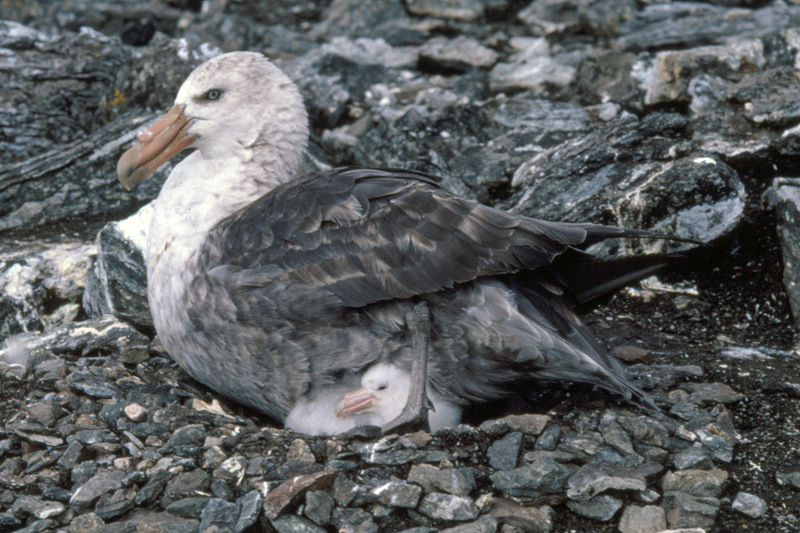 Giant Petrel nests are much bigger than those of other ground nesting Antarctic birds such as penguins. 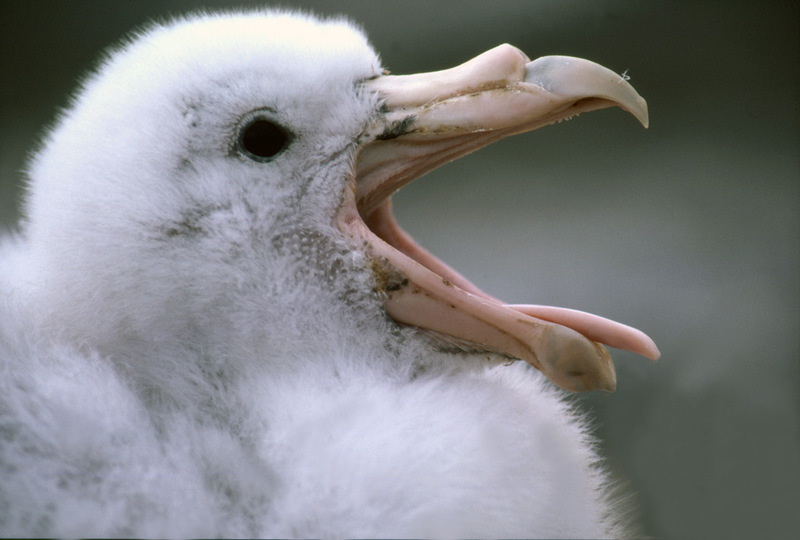 Giant Petrel chick gets bored while waiting for lunch. Like the albatrosses that they resemble, giant petrels can sometimes have difficulty in taking off from a non-sloping surface if there is little or no wind (fortunately though, Antarctica is the windiest continent, so this last situation is rare). Long run ups across the surface of the sea are quite common, with the bird having to stop and rest for a while if it is not successful the first time. My favourite example of this is one that I didn't actually see directly, but just saw the evidence. At the beginning of the winter the sea-ice had just formed, it was mixed with pack ice and had a covering of snow. I was out for a bit of a recreational ski trip when I came across a set of Giant Petrel footprints in the snow (They have large webbed feet and prints are easy to recognise) after more than 50m of getting no-where, the ice rose up a small slope to a height of about a meter and the footprints led up it, surely this was enough to get the bird airborne? Nope, on the other side of the slope where it ended in a short cliff edge was the imprint in the snow of the poor petrel, a sort of untidy snow-angel where it had flopped back down again. Eventually the footprints did end and so it successfully took to the air. 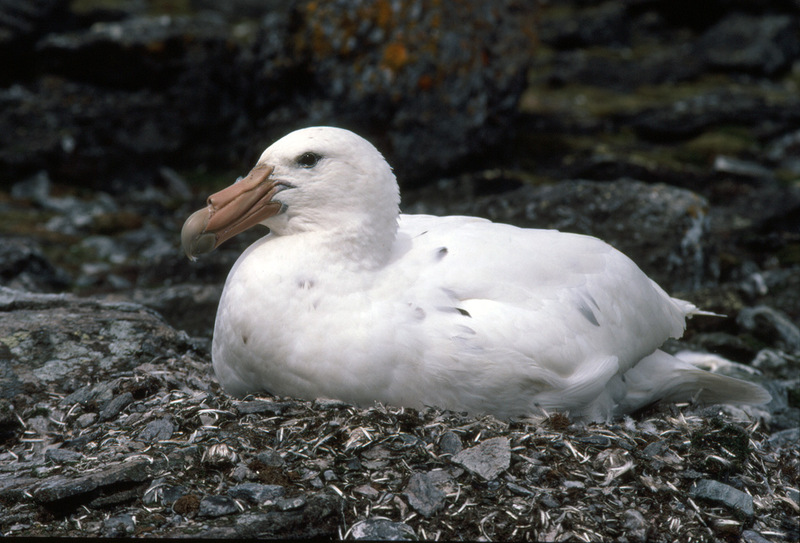 The rarer white form of the Giant Petrel, on Signy Island in the South Orkney's where this picture was taken, white forms were about 10% of the population. 10% of the population maybe, but being more photogenic, much greater than 10% of the pictures taken!